Anyone familiar with this projector? I want to know if the pulldown claw has one tooth or two. Also, there seems to be three potentiometers for speed adjusting and it seems to need a tricky balance between all three to get both 18fps and 24fps. Any information would be greatly appreciated. I'm not very familiar with the 8000, however I'm curious about your fps question. Is the 18/24 switch not working properly at either setting, or when adjusted correctly for one speed does not work at the other? It would be highly unlikely imo to have three potentiometers for two speeds. Doesn't make sense electronically. The last time I saw a thread like this it was for a sankyo with electronic speed adjust (two pots one for each speed) and the chap adjusted the bias for the record amp by mistake, as the pots look similar. At one time, the pots were adjusted to achieve 20fps for film transfer. Now neither speed is correct when the 18/24 switch is set to either position. One pot seems to affect the 18fps setting, one seems to affect the 24fps setting and the third pot seems to affect both. All three pots are side by side in a small opening at the lower front of the projector below the lens. They are only accessible when the front cover is removed. Coarse(overall) adjustment&fine tuning for each speed maybe? Interesting thread. I've heard them referred to as trim pots. 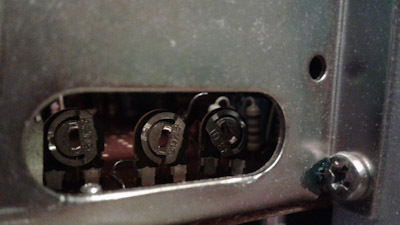 Potentiometer is the term I am familiar with regard to the Sankyo Stereo 800, they are accessible by removing the rear cover and the two potentiometers are located at the front of the projector on an IC board. The top one can be adjusted to alter the speed at 18 fps. The bottom the same for 24 fps. Very helpful knowledge I found. Can be very useful for film transfers and even re-recording but will not equal sync pulse. I am mystified as to why there are three pots however. You can obtain a service manual from Oldtimer Cameras, here in the UK. I am sure that such a manual would answer your questions. Thank you Maurice. I have this manual and it has nothing in it that addresses this. "My Chinon SP-330MV has three speed pots. One only changed the 18fps, one changed the 24fps, and the third one had an effect on both." Does this comment help you in any way? Does the manual have a schematic in it? Some (Eumig) often included them, others (Elmo) didn't. I don't have one of these, but I'd love to know what that third pot is for! From Maurice's quote it sounds like an adjustment of the reference voltage that the 18 and 24 are being regulated against, but I don't know why they would want to do that: it's overthinking the plumbing! I think what Maurice quoted from a previous post is correct. I can tell you that the left pot adjusts the 24fps speed, the center pot adjusts the 18fps speed and the right pot seems to have an affect on both. That's why my initial post spoke of a 'balancing act' between all three. These three seem to need to be adjusted in just the right way. Otherwise, the speeds are off and jitter-free film transport is also compromised. If you are stressed and puzzled when faced with 3 Chinon speed pots instead of the usual 2, you can now relax. I have worked out why a lot of the Chinon Super 8mm Sound projectors have 3 adjustable pots on their speed boards. The outer 2 pots set the 18 and 24 fps speeds as per usual. But the mysterious 3rd pot in the middle sets the rewind speed. Yes, it sets only the Rewind Speed. Who would have guessed? So this original fresh information explains why there are 3 speed pots on Chinon sound projectors and not just the usual 2. This news should dispel any confusion, speculation and rumour about the purpose of the 3rd pot and how to reset them. Frank, thank you for solving this mystery. Your explanation makes me breath a sigh of relief. When you say 'rewind' do you mean actually rewinding from the take-up reel to the feed reel or do you mean projecting threaded film in reverse?